Encourage your young homeschool student's skill development with the activities in this workbook companion that features additional worksheets and activities designed to be repeated by the student throughout the lesson and beyond. Beautifully illustrated lessons reinforce concepts in Bible, language arts, science, social studies, health, safety, and more. Encourage your young homeschool student's skill development with the Horizons Preschool for Three's Student Workbook Companion. Beautifully illustrated lessons reinforce concepts in Bible, language arts, science, social studies, health, safety, and other subject areas. As children complete each hands-on learning activity, they develop a wonder of God's creation and a lifelong love of learning. Each Horizons Preschool for Three's lesson includes four worksheets in the Student Workbook, as well as one additional worksheet from the Horizons Preschool for Three's Student Workbook Companion. 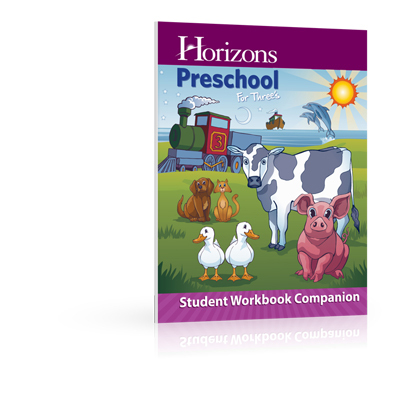 Start your three-year-old's homeschooling education right with the Horizons Preschool for Three's Student Workbook Companion from Alpha Omega Publications.